The standard cleaning and degreasing chemical for vehicle and equipment wash down at a City Council was replaced with Triple7 Heavy Duty quick break degreaser to determine the effects on the Oil Water Separator. 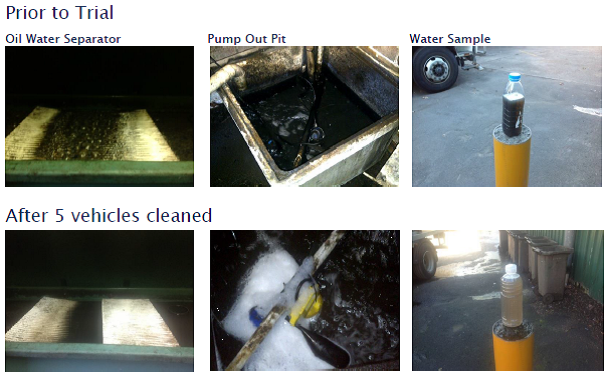 The council was experiencing high oily wastewater disposal costs due to poor oil water separator performance and after just 5 washes, not only is the wastewater free from oil saving them in excess of $20,000 annually, but recycling the water has become an option for further environmental sustainability and cost savings. The photos below show before and after the trial, and the results can clearly be seen. Triple7 Heavy Duty degreaser does not emulsify with greases and oils, but lifts and releases, enabling significant improvement in waste water quality. After lifting oil and greases the quick break degreaser releases them again so they may be separated in a oily water separator. Are you aware of what YOUR annual ‘waste water’ disposal cost is?